*Low income before tax cut-offs (LICOs) – Income levels at which families or persons not in economic families are expected to spend 20 percentage points more than average of their before tax income on food, shelter and clothing. Economic families in the Yukon Territory, Northwest Territories and Nunavut and on Indian reserves were excluded as the low income cut-offs are based on certain expenditure- income patterns which are not available from survey data for the entire population. Although the low-income before tax cut-off (LICO) is not applicable in the territories or on Indian reserves, other Census data reveal that in 2005, the median income for First Nations people living in the Yukon was $20,300 compared to a median income of $34,951 for the non-Indigenous population. In the Northwest Territories, the median income for First Nations people was $17,558 compared to $49,219 for the non-Indigenous population. Source: CICH graphic created using data adapted from Statistics Canada – Catalogue no. 89-634-X 16. Aboriginal Children’s Survey, 2006: Family, Community and Child Care. http://www.statcan.gc.ca/pub/89-634-x/89-634-x2008001-eng.pdf -accessed July 17, 2017. 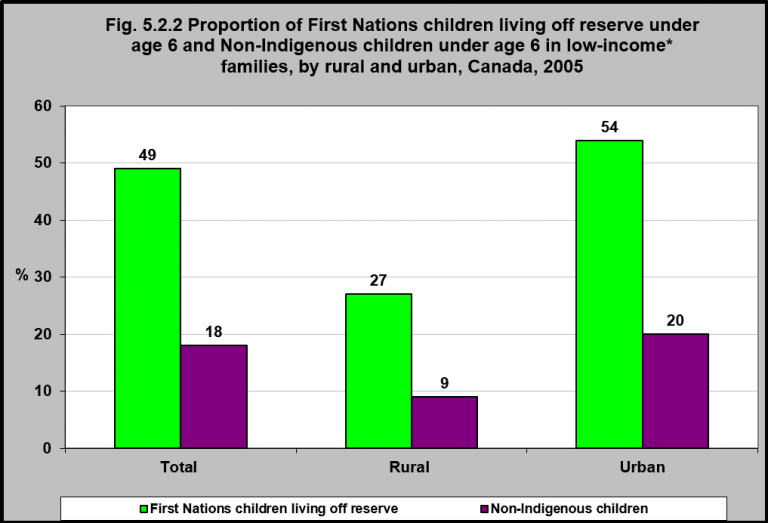 In 2005, 49% of all First Nations children under 6 who were living off reserve lived in low-income families, compared to 18% of non-Indigenous children under 6. First Nations children under 6 who lived in urban communities (off reserve) were about twice as likely as those living in rural communities to live in low-income families – 54% versus 27% respectively. This was the same for non-Indigenous children. 1Canadian Council on Social Development. (2007). Populations vulnerable to poverty: Urban poverty in Canada, 2000. Ottawa, ON: Author. 3Aboriginal Children in Care Working Group. (2015). Aboriginal children in care: Report to Canada’s Premiers. https://www.canadaspremiers.ca/phocadownload/publications/aboriginal_children_in_care_report_july2015.pdf – accessed September 12, 2017.